I’m currently 35 weeks pregnant and my toddler is still nursing, so I’ve finally accepted that he will not self-wean before the baby arrives. Hopefully, he won’t ramp up his nursing too much once my newborn arrives–I think I can handle one or two nursing sessions with him per day, especially once my milk comes in and my breasts are not so terribly sensitive as they are now in late pregnancy. Sometimes it feels like I’ll be nursing my son until he’s an old man. Setting some guidelines has helped. Image source. This has actually been true prior to my pregnancy, but it’s especially important to me right now. There’s just no way I’m willing to finagle my belly, a nursing shirt, a nursing bra, and a nursing toddler outside of my home. No. Sorry, Felix. I think my kiddo would like to be nursing more and for longer sessions–once he gets himself situated, he’s happy to stay on there for 20 minutes. I can almost handle this on the left side, but my right breast is far too sensitive. As soon as I begin to get uncomfortable, I tell him milkies will end after I sing “Baa, Baa Black Sheep” one time. Then, we either switch to the other side or if we’ve done both, we’re all done. As much as I love to nurse my children to sleep, to watch their eyes roll up into their heads and to see their sweet, sleeping faces pressed close to my body, I just can’t maintain the nursing session long enough to conk out two-year-old. In terms of sleep, it’s more disruptive for him if I end the nursing session before he’s out than if I never start at all, rocking or cuddling him to sleep instead. This one has been hardest for us to enforce, especially because he asks me for “just widdle bit-a milkies, pwease” at bedtime. That’s usually when Daddy comforts him to sleep while I read books to our five-year-old. I like to remind Felix at least once per day that his baby brother is going to bring more milk with him when he arrives. Felix seems distressed at the thought of sharing my breasts with a new sibling, so we look at a lot of pictures of both him and his older brother nursing as infants. We talk about how babies need milk for food and comfort and nurse a lot. It seems to comfort his toddler brain to think of the baby not as a competitor for the milk, but as someone who will catalyze the return of the bountiful stream. My hope right now is for a smooth transition to tandem nursing (is such a thing possible?) and for my oldest son to be so much more interesting than nursing that my toddler will prefer wrecking Lego sculptures to sitting on my lap nursing all day while I’m trying to care for an infant. 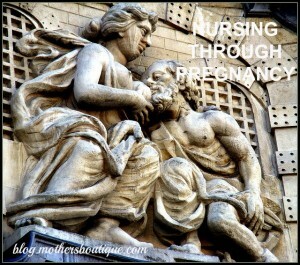 Did you nurse throughout your pregnancy? Leave us a comment to share some guidelines that worked for your family.